When I saw this . . .
. . . posted on a friend's Facebook page my thoughts turned to the darker side of family history. We openly discuss suicide these days and we hope we are observant of others, noticing any hint of need for help among our friends and acquaintances who may fall prey to that particular darkness. Hotline help phone numbers are at the tips of our fingers if we carry cellphones and it's easy to find lists of warning signs to watch for. How I wish the resources of today had been available for these ancestors. 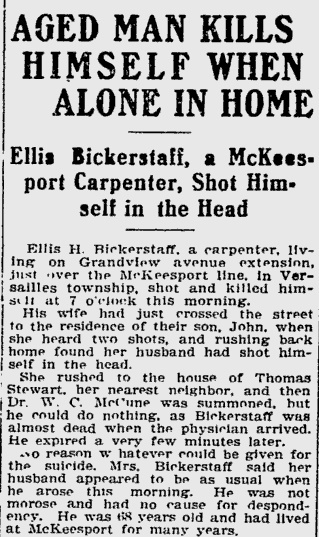 Ellis Bickerstaff, my maternal great-great-grandfather, immediately came to mind after reading my friend's post. Ellis was a veteran of the Civil War who served in a prisoner of war camp. Perhaps he was a gentle soul and the experience left him "broken" in some way, broken-hearted, broken-spirited, even years later. Perhaps there were other reasons for him to choose suicide. By all appearances (from the perspective of 100 years) he'd made a success of his life. And yet in 1907, at the age of 67, he took his own life. He left a widow and three adult children. Always through my mind trails the question Why? You can read more about Ellis here, here, and here. 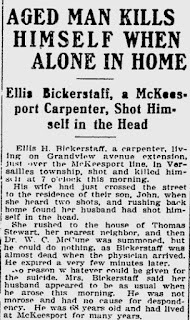 Within a day I remembered that Ellis is not the only ancestor who committed suicide. Three of my collateral ancestors also took their own lives. 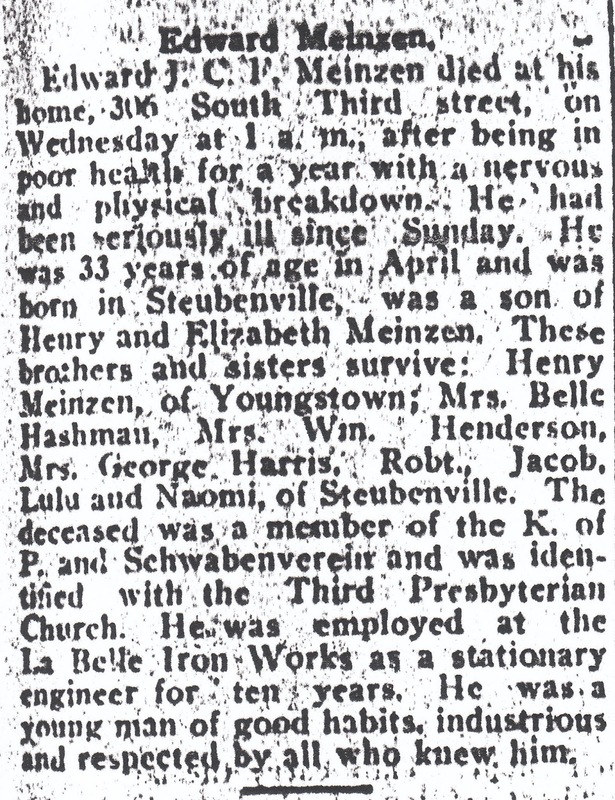 Edward Meinzen, my maternal grandfather's older brother, suffered from a mental breakdown for several years. 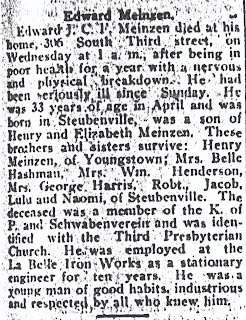 He had worked at La Belle Iron Works where his younger brother was killed. Edward was in poor physical health in 1911 when he took his own life. His death certificate states that he committed suicide by "opium poisoning." Opium was a common pain reliever in the 1800s and early 1900s, available without a prescription, and possibly without knowledge of its addictive nature. Edward was just 32 years old. As far as my current research shows, Edward was not married. You can read two obituaries and his death certificate here. Catherine Froman Turner is the younger sister of my paternal great-grandmother, Tressa Rose Froman Doyle. She was born in 1872, just months after her father's death. Her childhood, and that of her six siblings, was probably not an easy one. 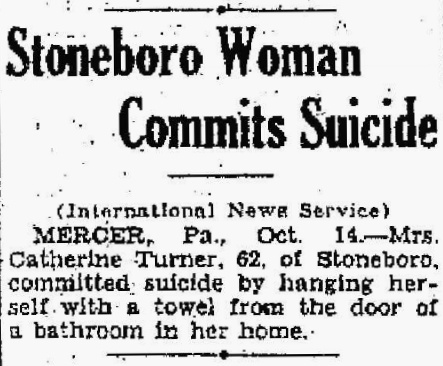 She had been a widow for two years when she took her own life in 1933, at the age of 61. She left two adult sons. You can read more about Catherine here. Geraldine Mae Meinzen, known to me as Aunt Jeree, is my mother's sister. She is my most recent relative to commit suicide. She was 65 when she took her own life in 1984. Forever there will be the question Why? but after the fact one never knows the why of a suicide unless a note was left. Depression, chemical imbalance, environment, circumstances, addiction.... After the fact one can only mourn. How I wish that for each of these relatives there had been someone at hand who realized the danger and had helped, that there had been a "suicide hotline" they could have called. I can't help but think of darkness when a person is contemplating suicide, and darkness after the event. Do you have ancestors who took their own lives? Your comment made me think for a while about my 4th great grandfather. He was a veteran of the War of 1812, and was generally described as "insane" later, and died in the New Hampshire State Hospital in the 1840s, but no death record or gravestone record exists. A chaplain at the state hospital was unable to find any existing records on him for me. I always wondered if he took his own life. How sad, Heather. It's hard not knowing what happened. It's unusual not to find some record. I think there was an awful stigma associated with suicide in decades and centuries past. It's almost as if the people weren't worthy of more attention -- no obituary, no gravestone, etc. So sad. My great-grandfather was a veteran of WWI and took his own life when he was 55 years old. He had a successful tinning business, a loving family, and his first grandchild was just born. However, it had been said that the war had deeply affected him, and he may have been gassed during the war and didn’t get full treatment. Although undiagnosed, he likely had some kind of PTSD from the war. If only some of the resources available today were available for him back then. How sad, Eva. I don't think doctors understood much about helping soldiers after WWI and didn't realize the effects of trauma. Yes, if only there had been understanding and especially resources then! I have at least two I can remember off the top of my head - both young men who died a few years before WWI. You're so right about a darkness. One of these young men were never given a grave marker. I've always wondered if it was because of the way he died. He also had a mentally challenged brother who lived into his 50's but also was never given a grave marker. The rest of the family - in the same cemeteries - have tombstones. Laura, you're the second person (so far) to mention no grave marker for someone who committed suicide. I have to wonder if there was some kind of stigma attached. Whatever the reason for no marker (or even obituary, as the case of one of the women of this post) it's just too sad. Luckily there are no suicides that I know of in my family. Friends of my parents however... had three sons that all committed suicide. The middle boy first, because his girl moved away then broke up with him. Then the older boy, blaming himself for not seeing the signs, then the youngest one because... why not? No true reason is known. At that time, in the early 60s, as in the old days... no one wanted to know about feelings. No one talked about sadness. Especially boys, who must be strong! Such a shame! Good for you for writing about it. How ad to have had three children in the same family commit suicide, Dianne. The heartbreak is beyond anything I can image. I'm glad we've moved beyond silence when it comes to feelings but even so, suicide is still a problem. My paternal grandfather committed suicide when he was in his fifties. He was a WWI vet who'd been gassed as well. Oh, Liz, I'm so sorry. The horrors of World War I and is awful lasting effects touched (and still touch) the lives of so many. This is a tough subject to write about and you have done a beautiful job. I know of 2 suicides in my family - my grandmother’s brother and my grandfather’s uncle. Then yesterday while working on the line that I featured for this week’s 52 Ancestor’s theme I found another one. Thank you, Wendy. It's so sad to find an ancestor who took his/her own life. Even several generations removed it is still a shock. Thanks for shining the light on the darkness. One never knows why one ancestor destroys their life through suicide (or crime or alcohol) and another does the best they can to build a good enough life. But I love how you're not hiding and you're not judging. Well done. This is an interesting and sad subject to deal with. You wrote about it very well.I only recently came across an intriguing note on an Ancestry tree about an ancestor who apparently committed suicide. Unfortunately, there was no source given for the information and newspaper searches haven't been fruitful...yet. 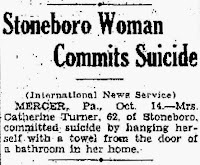 I hope to find out more and learn about her (she was a young married woman and according to the note, borrowed money often and committed suicide when she could not repay the money). Very sad. Thank you, Sue. How sad if that's true about your ancestor. I hope you're able to find more information, enough to know for sure. So many comments here about WWI vets. I'm researching a relative who also served in WWI. His family doctor said he suffered from shell shock, anxiety, and alcoholism - among other things. I'm having difficulty finding out much more as he never married and, of course, his are among records destroyed by fire. He checked himself into a Veteran's Home and lived out his life there. Thank you for your sensitive post. Thank you, Kathy. I think the WWI vets suffered more than we know, at least from stories and history I've read. And no one quite understood how to help them, especially if they kept silent. How sad for your relative. I hope you're somehow able to learn more about him. Do you have a blog? I've looked but haven't found it. If so, I'd love to visit and read. Yes. abbieandeveline.com. Come visit! I was forced into a very, very long break due to chemo brain, but the past 6 weeks or so I've been trying to get a post up about once a week. Ellis was married to my 2nd great aunt Lucy Umbarger Irwin Bickerstaff at the time of his death. I'm thinking we are both related to their son John Alexander Bickerstaff, who was named after my great grandfather John Alexander Umbarger. Hi, Sue. It's nice to "meet" you. I haven't done much research into Lucy Umbarger because she isn't my line. Ellis's oldest son, Edward Jesse Bickerstaff, is my great-grandfather. Very sad stories that you have written so sensitively about. It brought to mind two stories in my family history. Haydon Lounds committed suicide, with the coroner’s report, in the local paper, linking his death to lead poisoning from his work as a coach builder. My grest uncle John Danson died whilst training in army camp in 1917. There seemed to be a family mystery surrounding his death and he is not listed on the war memorial in the church. I sent away for his death certificate and read the stark statement “cut his throat whilst temporarily insane” - how awful. His death left his young daughter an orphan, as her mother had died of TB at the age of 21. Truly a tragic case. Thank you, Sue. How sad for your ancestors and their families. I think lead poisoning can cause brain damage which could lead to Haydon's thought processes changing and possibly to depression. Oh, poor John Danson! That's just awful and especially to leave his daughter as an orphan. Truly he must have been in a very dark place. For both men and their families, such tragedies. Reading all of these accounts of suicides in people's families makes me wonder just how prevalent it was and continues to be. Maybe we need these reminders every so often, to pay attention to those around us who may be hurting, desperate, and alone. I imagine that in decades and centuries past, when someone committed suicide, the family generally did not talk about it so, as you suggest, Liz, it's likely that was more prevalent than we think. It's a good idea to have the reminders.